I have included a copy of my final proposal below, to give a better idea of the agreed direction of work. As this is a practice based thesis, I fully expect the work to evolve from what I originally proposed. This practice-led body of research will investigate the multi-layered interstitial spaces that occur in the areas between infrastructure and planned development. My photographic practice will be informed by theoretical and historical discourse, through an exploration of existing literature relating to marginal/liminal landscapes. It will also reference current research in the disciplines of geography and planning where the key features of edgelands have been defined. My practice- led research will attempt to extend, and explore the way we see the marginal landscape. Working on multiple geographic locations I will create an archive, leading to a series of self published limited edition photo books and I will also explore the ways in which I can share and disseminate my work within the regions, working with established community arts organizations. These sites will be seen and discussed as interconnected phenomenon, hence the term ‘archipelagos of interstitial ground’. This will be done through a series of photographic studies informed by the work of photographic surveys such as, the Mission Photographique de la DATAR, which ran from 1984-89 and is being revisited through a current commission. As well as the history of the photographic survey concerned with the urbanization of the landscape. To interrogate through photography and theory, the specific historic, temporal, social and political contexts of edgelands, SLOAPs, interstitial and subtopian spaces (see theoretical context). To develop new perspectives on these spaces through the creation of a series of photographic works, partly informed by the history of photographic survey works from the 1980s onwards, and photographers for whom edgelands/interstitial sites have formed a central part of their practice including Joel Sternfeld, Mark Power and Alex Soth. To create a new body of photographic work based on the photographic survey, and to disseminate this work via a set of specific outcomes, including an archive and a set of photographic books, as described above. To investigate, in partnership with community organizations and participatory public art bodies the ways in which my practice-led research may provide enrichment within the community. To investigate the use of visual documentation, (auto)ethnography, (flaneur and derive) as methods for exploring encounter, intervention, and habitation, in relation to current photographic practice. To investigate the use of an online presence through blogging and digital publication to extend the reach of the project and as a means of connecting with a range of communities, from academic to local. To explore the debates around Marc Auge’s Non-Place (1994) and to consider the ways in which visual practitioners such as Xavier Ribas have been a central part of this debate. To investigate current thinking around photography and the urbanization of the landscape, related to the geography, sociology and anthropology of these sites, exploring edgelands, SLOAPs, interstitial spaces, and subtopia. Architecture, and urbanism theory related to interstitial sites and the built environment. Ian Nairn’s (various 1955-2013) writings on the city and the homogenisation of the built environment. 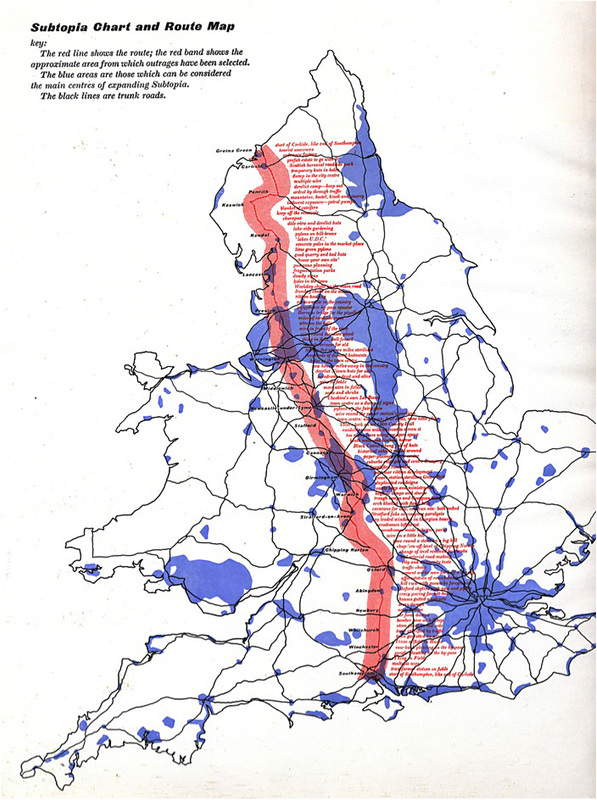 Roger Trancik’s (1986) exploration of the factors leading to Lost Space within our towns and cities. Marion Shoard’s (2002) defining of edgeland spaces, which has since been expanded by theorists looking at urban interstices, such as Manchester School of Architectures Intimate Cities Atelier (2012), Anna Jorgensen’s (2007, 2012) writings on urban wildscapes. As well as Helen Armstrong (2006) and Kenny Cupers (2004), exploration of them as places of contemplation. Geography and anthropological theory exploring the socio-political factors surrounding these sites. Tim Edensor’s (2005) work on the uses of these sites. Gold and Revill’s (2003) work on power and vernacular landscapes. Ethnographic study as means to enrich our understanding of a site. Arnd Schneider’s (2010, 2013) work on art and ethnography. Miwon Kwon’s (2001, 2004) work on site specific art, and Merlin Coverley’s (2010) work on pychogeography. The sites being photographed are intrinsically linked to the demise of the UK’s industrial sector and therefore the socio-political history of the regions depicted, which will be explored through archive collections to help ground the psychogeography of the area. My work references socio-political photography commissions and topographic surveys since the Mission Heliographique (1851), to Terrain Liquide’s current exploration of France (2014). I will use the surveys to explore our depiction and relationship to the environment during a given political period. Paul Farley and Michael Symmons Roberts built on Shoard’s work in their book Edgelands; Journeys into England’s True Wilderness (2011). Not only did their book explore the key characteristics of Edgelands, but placed them within a wider framework of artists and writers that had dealt with it. A range of Photographers including, Sternfeld, Soth, Power and Graham have produced work concentrating on margins, from both a physical and psychological perspective. However there is an absence of specific photography looking at the interconnection of sites within the UK. There has recently been photographic resurgence in the use of the photographic survey by regional arts organisations and collectives to explore their communities. This includes work by MultiStory, Preston is My Paris and Human Endeavor. There has also been an increase on its use as a means of producing ‘State of Nation’ interrogations, such as Magnum’s Postcards From America (2012) and Mostyn’s Return Journey (2014). I will work using a mixture of the 5×4 and 6×7 formats, linking my work to the traditions of the genres being researched. Practical outcomes will be a series of individual but interconnected books that will be able to be read on a local, regional and national scale or cross-compared.